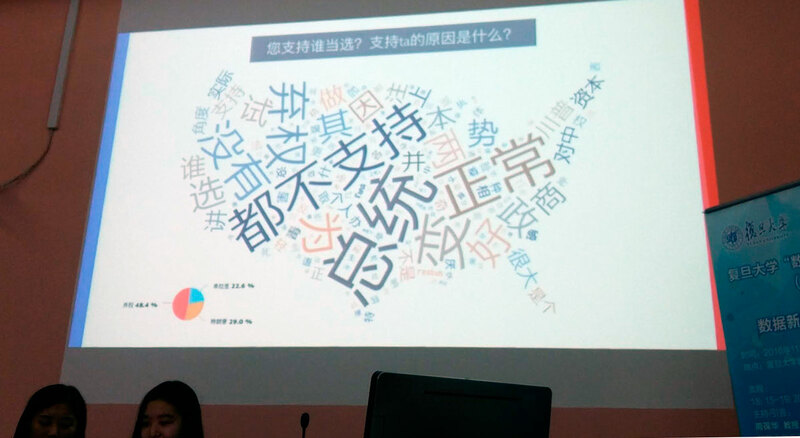 I’ve just returned from a week in China, teaching data journalism to students from all over the country at Fudan University (sponsored by the U.S. China Education Trust). Helped by a fabulous co-instructor, Yan Lu, we taught them about acquiring data, data wrangling, storytelling, visualization, SQL, mapping, news apps and more. The students, working journalists and professors, were quite impressive. Working in groups, they created several data-driven projects of their own — a few of which were publishable after just a few days’ work. For a mapping exercise, students identified several locations by latitude and longitude. Students demo their project related to Chinese perception of the U.S. presidential election.